In: Alessandro Soro, Margot Brereton, Paul Roe. Social Internet of Things. Pages 85-106 ISBN 978-3-319-94659-7 Springer International Publishing Cham 2019. In: Proceedings of the 2019 CHI Conference on Human Factors in Computing Systems. ACM International Conference on Human Factors in Computing Systems (CHI-2019) May 4-9 Glasgow United Kingdom CHI '19 ISBN 978-1-4503-5970-2/19/05 ACM 2019. In: Extended Abstracts of the 2019 CHI Conference on Human Factors in Computing Systems. ACM International Conference on Human Factors in Computing Systems (CHI-2019) May 4-9 Glasgow United Kingdom ISBN 978-1-4503-5971-9/19/05 ACM 2019. In: Extended Abstracts of the 2019 CHI Conference on Human Factors in Computing Systems. ACM International Conference on Human Factors in Computing Systems (CHI-2019) May 4-9 Glasgow United Kingdom ACM 2019. 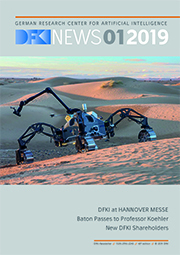 In: Robotics and Autonomous Systems (RAS) 110 Pages 12-32 Elsevier 12/2018. In: Proceedings of the ACM on Programming Languages (PACMPL) Proceedings of the 2018 ACM SIGPLAN International Conference on Object-Oriented Programming, Systems, Languages, and Applications (OOPSLA). 2 OOPSLA Pages 119-1 ACM 11/2018. In: Proceedings of the Fifth International Workshop on FPGAs for Software Programmers (FSP). International Workshop on FPGAs for Software Programmers (FSP-2018) August 31 Dublin Ireland Pages 1-9 VDE 8/2018. In: Ultramicroscopy 191 Pages 1-10 Elsevier 8/2018. In: Proceedings of the 17th International Symposium on Parallel and Distributed Computing (ISPDC). International Symposium on Parallel and Distributed Computing (ISPDC-2018) June 25-28 Geneva Switzerland Pages 17-24 IEEE 6/2018.